The four space shuttle STS-135 astronauts visited the Intrepid Sea, Air and Space Museum on Aug. 18, 2011. The Intrepid was chosen as the retirement home for the shuttle prototype Enterprise. NEW YORK — The last astronauts ever to fly on a NASA space shuttle visited the future home of the prototype for their winged spaceship today (Aug. 18): a World War II aircraft carrier that now serves as a floating museum. 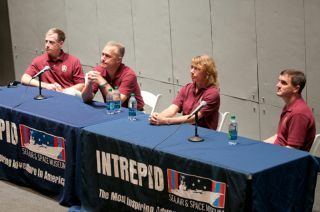 The four astronauts were visiting the Intrepid Sea, Air and Space Museum to speak to children and the public about their mission and the future outlook for NASA. The museum is docked here on the west side of Manhattan and will serve as the retirement home for NASA's space shuttle Enterprise. Enterprise was the first shuttle orbiter built, and was used as a test vehicle for glide flights, though it never made the full trip to space. Ferguson and his crewmates flew on NASA's STS-135 shuttle mission in July. Pilot Doug Hurley and mission specialists Sandy Magnus and Rex Walheim rounded out the crew. The 13-day spaceflight was the 135th and last flight of NASA's 30-year shuttle program, which is being retired to make way for a new program aimed at deep space exploration. When the Intrepid's chief financial officer, Patricia Beene, told the crowd that the museum is "soon to be the proud new home of the space shuttle Enterprise," the audience erupted into cheers. "That's not prompted, I just want you to know," Beene said. "That's how we feel about getting one here." NASA administrator Charles Bolden announced the permanent homes of the agency's four shuttle orbiters in April 2011. The four lucky museums won out from a field of 21 hopefuls. The Intrepid was awarded Enterprise, which is currently housed at the Smithsonian's National Air and Space Museum's Steven F. Udvar-Hazy Center outside Washington, D.C.
"We are so looking forward to sharing the OV-101 Enterprise with you here in New York City," said NASA's deputy administrator, Lori Garver, who joined the crew at Intrepid today. Now the space agency is turning its sights to deep space, and is building a new heavy-lift rocket and capsule to take people there. "Ultimately, maybe in 20 or 30 years, we can seriously look at going to Mars," Ferguson said. In the meantime, NASA will continue operating the International Space Station through at least 2020. The final shuttle mission, in fact, was a delivery trick to stock up the orbital outpost for the years to come. "This mission was really special to me because it was an opportunity to go back to the International Space Station," Magnus said. "The station is a really special place. I think it's something we should all be very proud of. Please pay attention the next 10 years or so as we continue to work up there." "Has anybody ever dreamed they could fly?" Rex Walheim asked the kids. "That's the coolest part of flying in space. You can fly like Superman." The crew also answered questions from the students, such as how they were able to become astronauts. "It seemed like such a remote chance and such a strange dream," Magnus recalled of her childhood goal to fly in space. She told the kids to believe in themselves and never doubt they can achieve anything if they put their minds to it. The astronauts are on a three-day tour of New York that included stops at the American Museum of Natural History and the New York Hall of Science earlier in the week. On Wednesday (Aug. 17), they even met Mayor Michael Bloomberg, who proclaimed the day "STS-135 Atlantis Crew Day" in their honor. Editor's note: This story was updated Aug. 19 to correct the spelling of astronaut Sandy Magnus' name in the second to final paragraph.